+ What is the purpose of the Downtown Westport Master Plan? The purpose is to develop, through professional and public input, a guide for how Downtown evolves in the future. The goal of the Plan is to ensure that Downtown Westport remains a vibrant and successful place that both residents and visitors can access and enjoy for its diverse entertainment, dining, shopping, civic and open space amenities, and a place in which a variety of businesses can thrive. + What aspects of Downtown are covered in the Plan? + What are the Boundaries of the Plan? 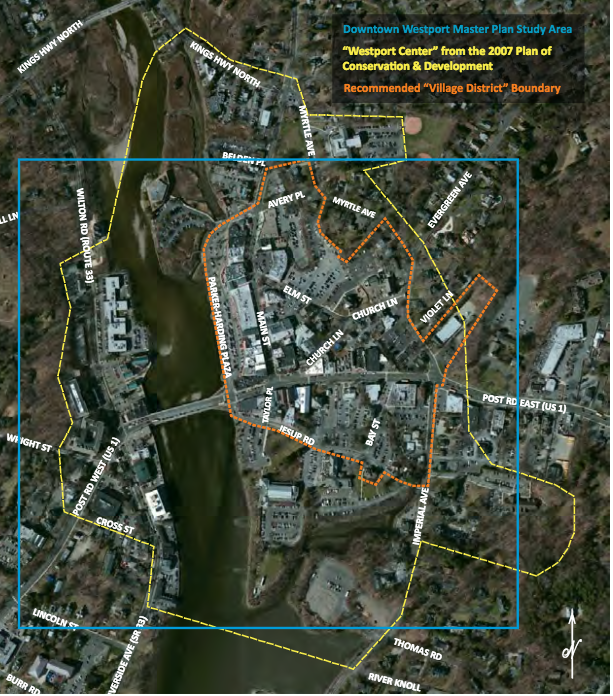 The map below shows the general boundries of the geographic area within the Town of Westport that this Plan covers. + Who is going to pay for all of this? Implementing the recommended projects will require prudent phasing, well-considered financing strategies, and mutually beneficial intergovernmental and public-private partnerships. + I filled out a survey and attended the charrette - Where do the ideas I shared fit in? The final draft of the master plan incorporated many of the suggestions given by Westporters during the YOUR DOWNTOWN campaign. Results of the survey and the charrettes, as well as all the comments made during the public input phase, are included in the appendices of the plan. + What about traffic and parking? A comprehensive traffic and parking study was complete by the consultant. Armed with this data, the Plan recommends a range of strategies for improving the supply and accessibility of parking. It also suggests ways to improve overall walkability, make intersections safer, and reduce vehicular traffic by creating conditions that encourage walking. + How can I comment on the Plan? While the formal public comment period is closed, comments can be submitted to info@downtownwestportct.com or by clicking on the comment link above.